Times have been turbulent in Turkish politics during my absence. The most striking development has been a case, by no less than the chief prosecutor, to close the ruling AK Party, on charges of not being secular enough. It calls for 71 members of the party, including prime minister Recep Tayyip Erdoğan and President Abdullah Gül, to be banned from politics. The AK Party’s predecessors, Welfare and Virtue (RP and FP, respectively), were themselves closed down by the Constitutional Court in similar circumstances; the charge here is that AK is merely their continuation. But many have expressed disappointment at the prosecutor’s case, as it appears to hinge largely on the public speeches made by those 71 implicated leaders and less on, for instance, evidence of non-secular AK legislation. AK was the moderate half of a split that occurred following the FP’s closure. The other half, which became the Felicity Party (SP), is pious, xenophobic and not very popular. It won just two percent of the vote in last year’s election; AK won forty-six percent. It was the SP that was behind protests against Pope Benedict’s visit in 2006, where “he’s coming to resurrect Byzantium” was the bizarre rallying call. The SP has also organised similar protests denouncing such targets as Israel and the Danish cartoonists who depicted the Prophet Muhammad. Mr Erdoğan met the Pope, was only the second Turkish prime minister to visit Israel, and stayed sensibly quiet on the cartoon issue. You would think it would be the SP, not AK, that is targeted in an anti-secular lawsuit. This leads commentators, including this blog, to conclude what everyone in Turkey already knows: that the chief prosecutor’s case is about more than AK’s overtly religious behaviour, of which there is scant evidence. The lawsuit reflects an ever-growing concern in Turkey that while AK might not be staunchly Islamist, it certainly is not staunchly secularist either. In some areas of Turkey, fewer and fewer restaurants are granted licences to serve alcohol, and there has been recurent talk of creating “alcohol zones” in towns and cities and prohibiting licenced establishments outside of them. Many Turks also say more girls than before sport the Muslim headscarf and that this is noticeable in cities as western-orientated as Istanbul. There is little doubt that AK’s six years in power has bolstered confidence among Turkish Muslims; many say the lawsuit is a reaction to that. Photographs such as the above, of First Lady Hayrünnisa Gül and Queen Elizabeth at a state banquet in Ankara earlier this month, are a firm confirmation that times have changed in Turkey. The Queen last visited Turkey in 1971, not long after the country’s second military intervention, when it would be unthinkable for the First Lady to have her head covered. It would have been unthinkable this time last year. 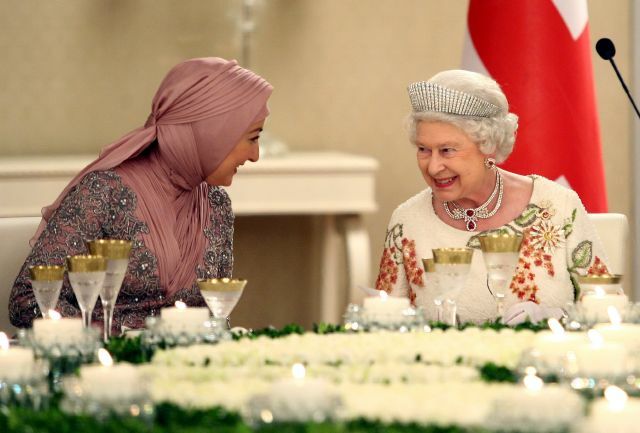 But Mrs Gül accompanied the Queen throughout the four-day visit. Yes, things have changed. Whether the lawsuit will be successful is unclear. AK originally planned to change a part of the constitution to render the case illegal, but the idea found little support among the opposition and has since been dropped. AK will now defend itself against the charges in court, but Mr Erdoğan is also rumoured to be arranging a successor party in case he loses. He has also been involved in a fiery and very public argument between the government and the judiciary. Those clashes will continue for sometime yet, both inside and outside the courtroom. Good to see you back, James. It will take time to re-establish your tayfa…….